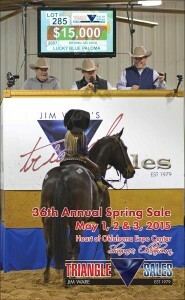 Shawnee, Oklahoma, May 12, 2015 – Triangle Sales held its latest equine auction May 1 & 2, and sales figures continued their double digit increases over prior year sales data. The May sale saw a 38 percent increase in average over the 2014 spring sale. 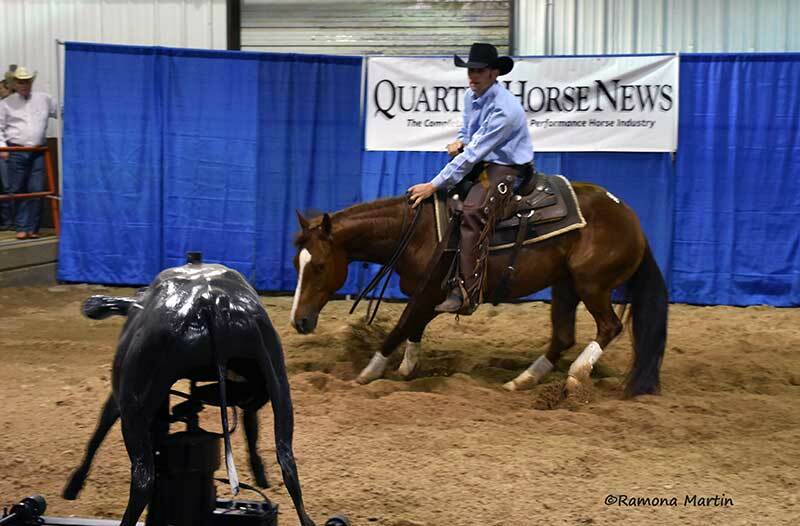 Showcasing the versatility of the American Quarter Horse, Triangle Sales’ May event offered horses to fit almost every discipline. Triangle Sales strives to be the No. 1 source for America’s Horse and buyers and sellers are taking notice. Buyers came from three foreign countries, and 29 states were represented with the top buying states being Oklahoma, Texas, Arkansas, Missouri and Nebraska. At the May sale, 81 percent of the consigned horses resulted in completed sales, and the average for the completed sales was $5,050. The top 10 sellers averaged $29,300 while the top 20 horses sold averaged $21,960. Lot 237, Twice N Catty, topped the May sale. Twice N Catty, a 2011 cutting mare by High Brow Cat out of the Dual Pep mare Tapt Twice and a full sister to all-time leading cutting mare, Dont Look Twice, sold for $85,000. Consigned by Waco Bend Ranch of Graham, Texas and purchased by Atwood Ranches of Kenwood, California, Twice N Catty was one of 72 National Cutting Horse Association money earners, prospects and broodmares, which sold for an average of $11,000. The top 10 selling cutting-bred horses averaged $24,900. The hammer fell at $46,500 for Lot 313, Corona And Pepto. The 2008 stallion who was demonstrated as a reined cow horse, roping horse and barrel horse, is out of the champion race mare Corona Cash and by One Time Pepto. Consigned by David James, Purcell, Oklahoma, and purchased by Skeeter Cox of Laytonsville, Maryland, Corona And Pepto was one of 16 National Reining Horse Association or National Reined Cow Horse Association money earners, prospects and broodmares, which sold for an average of $13,150. The top five horses bred for NRHA/NRCHA competitions averaged $23,200. 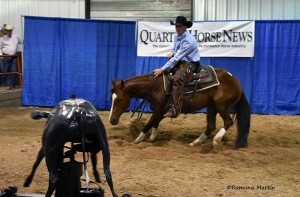 The top selling reining horse was Jessolution, who sold for $28,000 as Lot 163 in the catalog. The son of Einsteins Revolution was consigned by Luse Horses-Agent of Whitesboro, TX, and purchased by Jessica Harman of Grovertown, IN. There were 82 AQHA ranch and performance geldings sold at the May sale, and they averaged $6,300. The top 10 averaged $11,200. The highest selling ranch gelding was Lot 168, Santa Got Smart, who was consigned by Circle Y Ranch of Millsap, Texas, and purchased by Cooper Smith of Whitesboro, Texas. Even despite bad weather in February, Triangle’s three 2015 sales have each shown an increase of more than 30 percent compared to prior year sales. At the January Winter Sale, the sale average increased 35 percent compared to 2014 figures. Contending with a winter storm, the February Mid-Winter Sale average increased 42 percent compared to the 2014 February sale. The May sale continued the trend with a 38 percent increase. With a prime location in Shawnee, Oklahoma, Triangle Sales offers a wide selection of horses to fit many disciplines and is the “one-stop shop” for finding the perfect match for horse buyers. The Triangle Sale’s wide marketing efforts and key alliances also make it a perfect fit for those looking to sell horses with minimum fees and big incentives to attract buyers. 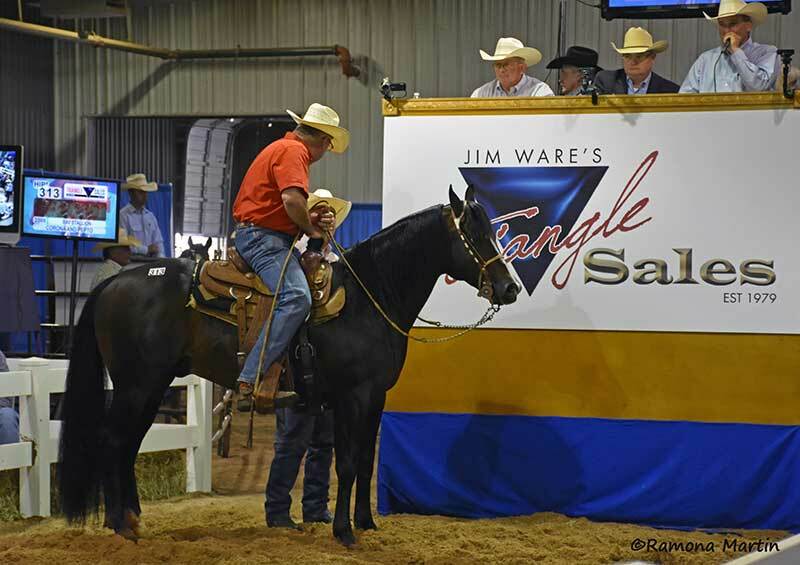 With Triangle Sale’s low consignment fees and superior customer service, sellers continue to bring their top quality horses to Shawnee for Triangle Sales. “This was our third sale to complete as new owners of Triangle, and we continue to learn from each event,” said Jim Ware, who purchased the sale company last fall. “It is important that we apply this new knowledge to each subsequent sale in an attempt to attract the best buyers and sellers possible. The next sale, the Triangle Fall Sale, will be held October 30-31, and buyers can expect the same type of diversified consignments as in previous sales. Top Cutters, Cow Horses & Reiners Were The Spring Fashion! Note: Twice N Catty is a full sister to Twice The Thrill, our high-selling cutter during the January Winter Sale at $66,000.